Here is one rice diet that you will have trouble refusing and have so much fun mixing together nutrition and convenience eating Japanese Onigiri. The Onigiri diet like other great rice diet plans is packed full of diet friendliness that you are going to need to make it to the finish line dieting healthy. It lays down the foundation for a balanced diet eating Japanese rice balls. Japanese rice balls also known as Onigiri or Omusubi in Japanese. Onigiri is like the sandwich of Japan. I'm not saying that Japanese people don't eat sandwiches, which they do on occasion eating out, but for people trying to keep pace with a busy day Onigiri is the way to go. 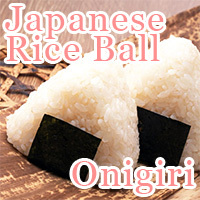 If you've are psyched about rice diets as much as Japanese people are, then you are going to love the Onigiri Diet Plan! Building on top of the rice diet, the Onigiri rice diet gives you the nutrition of rice and Nori seaweed along with an Okazu filling that you know is going to do your body good. Although eating carbohydrate foods such as those eating in any rice diet comes with the image of making your gain weight easily. For people just dying to hear how eating Japanese Onigiri, this rice diet plan is just for you. In this diet Slism, we introduce the Onigiri rice diet presenting the rules you need to follow in this diet going into the many benefits of eating rice in your diet and finishing with tips to make your Onigiri diet work. Just when you were getting tired of single food diets feeling bad about the way you eat. Always hunger, wishing there was a way to diet eating filling carbohydrate foods such as rice. With the Onigiri rice diet plan, this is your chance to eat carbs on the go losing weight. No diet plan would be complete without laying down the groundwork on how it can help you get slim eating. This rice diet plan is no different. Although when someone mentions rules, there is an image of being tied down. The rules of the Onigiri diet are not like that. The 1ST RULE of the Onigiri diet is to eat 1 Onigiri for breakfast, 3 Onigiri for lunch, and 1-2 Onigiri for dinner. The 2ND RULE is that there are no other rules! As self-liberating as going on the Onigiri diet sounds, you are still going to have to pay attention to the nutritional balance in your diet. How you do this lies in what's in your Onigiri, or Okazu. Okazu may sound outlandish at first but all it really means is something to go with rice. Like ham, cheese, and tomatoes in a sandwich, Okazu is where rice diets get the degree of freedom they need to be successful picking up in all corners of nutrition. Although most people associated eating carbohydrate foods like that on rice diets with gaining weight. The Onigiri diet is packed full with glucose giving you quick energy you can use right away. Glucose fuels your brain helping you recover from energy deficits in your diet. Eating rice is said to have a positive effect on your digestive tract as well as promoting healthy blood pressure. Making Onigiri with brown rice helps you take the Onigiri diet even further adding nutritional value and dietary fiber that you can count on. 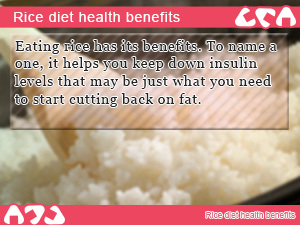 Rice diets are known to inhibit insulin secretion in your body. This helps keep you blood sugar down. With low levels of insulin in your blood, there is less a chance of the carbohydrate foods you eat being converted into fat. Insulin is in your blood is a hormone involved in storing energy from glucose or other simple sugars in fat cells for use later. The advantage of rice diets is that the digestion speed of rice is relatively slow. This helps reduce release of insulin throughout your body. By eating rice slowly chewing more than you normally do, it is possible to get full eating less. Chewing your food more is one way to prevent overeating as well as inhibit insulin levels in your body. Due to the time required to digest rice, it is possible to stay full longer feeling less hunger throughout the day. One thing that eventually bubbles to the surface when on dieting eating Onigiri is that it is easy to get tired and bored feeling stuck with white rice. Mix it up adding low calorie side dishes such as Kombu seaweed and Umeboshi dried plum to your rice diet. In addition to seaweed and dried plum, tuna and salmon are okay also. Just make sure not to go overboard when it comes to fat and salt intake in your diet. If you find yourself about to quit packing up ready to move to another diet, give it time. At the very least take a break, eating 1 less Onigiri making room for whatever it is you really want to eat. Eating nothing but Onigiri from the get-go may not be what you set out for. Try it for a week while cutting back on urges to eat sweets, drink alcohol, and otherwise do anything obstructive that would harm you diet. Some say the key to making it out in one piece dieting is to build a strong mind willing to overcome urges like wanting to eat or other forms of stress relief that don't contribute to your diet. The Onigiri diet on top of the nutrition it offers helps you get used to the idea of dieting building up momentum to the reach your goals in weight loss. 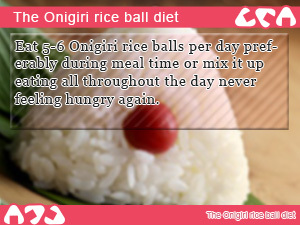 Eat 5-6 Onigiri rice balls per day preferably during meal time or mix it up eating all throughout the day never feeling hungry again. 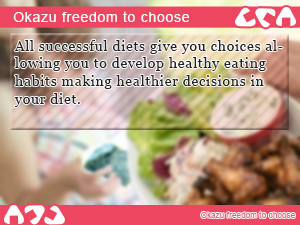 All successful diets give you choices allowing you to develop healthy eating habits making healthier decisions in your diet. Eating rice has its benefits. To name a one, it helps you keep down insulin levels that may be just what you need to start cutting back on fat.